Welcome to the Classic TV Horror Host Blogathon, a tribute to those memorable TV hosts who brought us late night horror movies! 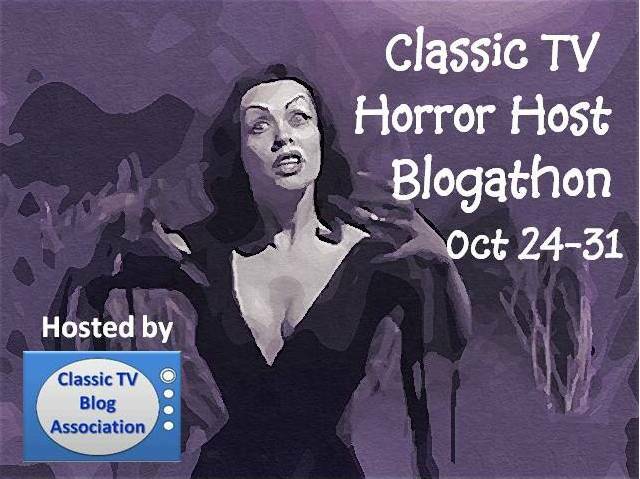 This blogathon will run from October 24-31 (concluding, appropriately, on Halloween). If you still want to participate, please make sure your blog complies with the Classic TV Blog Association's guidelines (hey, they're pretty general!). Then, send an e-mail to: classic.tv.blog.assoc@gmail.com. Include the title and web address of your blog--and specify what host you want to profile. Duplicate tributes are acceptable, provided there aren't too many devoted to one individual. Welcome Fans of Classic Television! I love the classic television shows from the 1950s through the early 1980s. I'm not one to lament that television isn't what it used to be; there are still fine programs on TV today. But I am thankful that DVDs and networks like MeTV and Antenna Television provide the opportunity to enjoy great television series like The Fugitive, I Love Lucy, Mission: Impossible, The Prisoner, Cheyenne, Peter Gunn, Studio One, The Twilight Zone, and Upstairs, Downstairs. When not watching these wonderful programs, I enjoy writing about them at my blog, the Classic Film & TV Cafe. I'm sure there are other classic TV bloggers out in the blogosphere. My goal to find them so we can band together to promote the Golden Age of Television. The purposes of the Classic TV Blog Association are to: (1) Educate the public about classic television; (2) Establish a community of classic television bloggers that support one another by sharing member blog links, commenting on each other's articles, promoting blog events, etc. There are no membership fees--this is an association of bloggers with a common interest. If you're interested in joining, e-mail me at classic.tv.blog.assoc@gmail.com and I'll send you details. If you're not interested in joining the Classic TV Blog Association--but still enjoy classic TV--I hope this site becomes a useful way to discover some informative TV blogs.